Free Shipping Included! 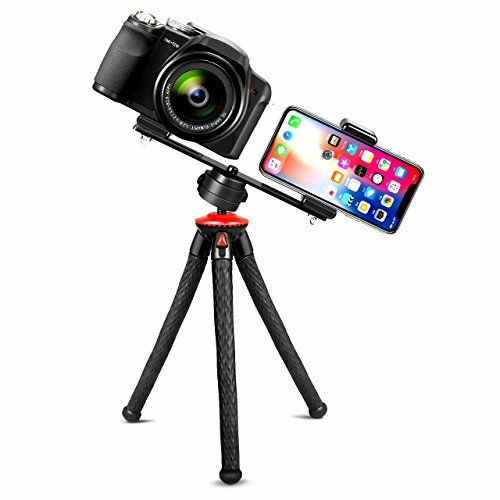 Camera Tripod, Fotopro Phone Tripod with Dual 1/4'' Screw Camera Mount Tripod Bracket for Smartphone, Portable with Bluetooth Remote Control, Gopro Adapter, Phone Adapter for iPhone, Samsung by Fotopro at EISF. MPN: UFO PLUS. Hurry! Limited time offer. Offer valid only while supplies last. 【Dual Camera Mount Tripod Bracket】 Fotopro UFO-Plus flexible tripod is designed for outdoor and indoor activity. Dual camera mount affixed with non-slip rubber pad and designed with 1/4" screw hole, and comes with 2 pieces of 1/4" adapter screws. Allows you to mount two cameras on a tripod for 3D Stereo Stereoscopic Photography. 【Flexible Tripod Legs】The waterproof legs and rubber feet can be bent arbitrarily and hold any object with superior stability. Bendable legs cling firmly to bicycle, around a pole, or even hanging from a tree branch. It can even be used as a desktop webcam stand or video tripod to get the perfect preferred angle. 【Multi-angle adjustable】The head of the tripod is 360° horizontal swivel. Allowing you to capture different angles on your trip. Flexible tripod for occasional private photos such as selfie, family celebrations and so on. 【Large Compatibility】The standard 1/4''screw helps to install device quickly. Tripod stand suitable for most smartphone, webcam, Gopro device, CSC camera etc. Recommended max load weight is 1.2kg for optimal performance. The universal phone adapter and the Gopro adapter are included, compatible with all iPhone, Samsung and most other smartphones up to 3.5 inches wide. 【Lightweight & Portable】Fotopro UFO-Plus flexible tripod with a weight of only 260g, a leg length of 9 inch (23cm), is short enough to fit perfectly in your suitcase or bag. So it is easy to transport during travels. Leave your trip full of joy. Blueboothcontroler is included.